In a market sector used to witnessing updates every six months to a year max, it comes as a surprise to realise the predecessor to the Fujifilm X100S - the plain old Fujifilm X100 - surfaced over two years ago. At that time the original high-end model with the retro design came with the promise of offering "the best image quality in Fuji's history". Quite some claim, which in hindsight now reads a little like an attempt to distract from the fact that here was a fixed lens camera that cost a whopping £900. Previously only models such as the Leica X2, from which Fuji seemed to have taken inspiration in terms of design and features, could justify that sort of big-money ticket. Launced alongside the Fujifilm X20, the new model isn't cheap either, with the X100S' street price currently sitting just under £1,000. As with its forebear, it's aimed at the photo enthusiast and would also serve well the professional street photographer or photojournalist who feels a DSLR is too bulky or intrusive, thanks to the Fuji's 23mm catch-all fixed lens. This is the exact equivalent of 35m on a 35mm film camera. A slip-on metal lens cap comes provided in the box, but as there's no way of convincingly securing it by, say, threading it through to the side lugs provided to hold a strap, we'd be a little concerned about losing it with repeated use. One of the criticisms of the original model back in the day was also that its slightly sluggish auto-focus speed made it more suited to carefully considered compositions than spur of the moment shots - not something you always have time for if street photography's your bag. Though subsequently boosted by a firmware update, the new model takes no such chances and so from the get go comes with the promise of the fastest AF on the market. Just 0.08 seconds reportedly separates a half squeeze of the shutter release button and the camera determining focus and exposure, ready for the photographer to press down fully and take the shot. That said it's not completely instant; you do witness the camera visibly adjusting the shot via the backplate LCD and the mechanics of the camera making its adjustment are also audible, albeit not distractingly so. Further promised improvements come via an increased resolution - up from the 12.3 megapixels of the X100 - and new 16.3 megapixel APS-C X Trans CMOS II sensor - APS-C being the size of chip regularly used in sub-£1,000 digital SLRs and an increasing number of compact system cameras. That's one way in which the Fuji shows its premium credentials, as is a new EXR Processor II, which is claimed to reduce image noise, usually visible in shadow areas and at higher ISO settings in low light, by up to 30%. In other words, the accent is as much on image quality as it is outer styling, which has thankfully remained largely unaltered between generations. 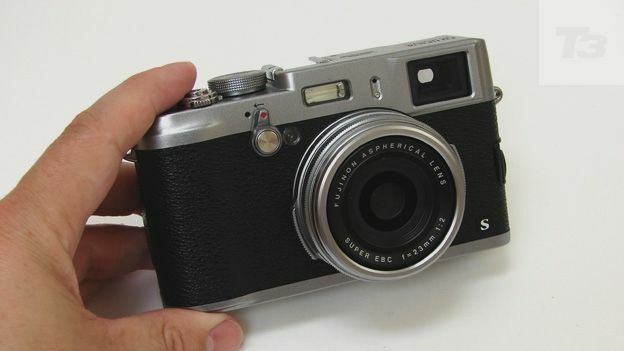 For a 'compact' it's worth pointing out that the X100S is bulky and substantial - and reassuringly so given the price. It's more a camera for the pocket of a poacher's jacket than your jeans. Though when a snapper looks this good, you'll probably want to attach the strap and show it off. Apart from minor stylistic modifications - the 'drive' mode selection (from whence video mode is selected, as well as panorama and multiple stills options) now has its own dedicated backplate button rather than being placed atop the scroll wheel for example - the camera largely looks and feels identical to its X100 predecessor. The 'Raw' button of its forebear is now marked 'Q' for Quick Menu, so providing a more expansive selection of key settings at the fingertip. The actual number of buttons hasn't increased then, merely some functions have been swapped around. Also remaining identical are the two rangefinder camera-like top plate dials, for adjusting exposure and shutter speed, while the lens ring that allows the user to manually adjust aperture by rotating it until it clicks into place at the right setting, even when the camera is switched off, has been held over, too. Switching between manual and auto focus involves flicking a slider switch at the left-hand side of the camera, with a further lens ring provided for the purpose of focusing. Usefully, when switching to manual, an enlarged image is displayed onscreen to better enable accurate focus. If you subsequently squeeze the shutter release button the view 'jumps back' to reveal the full frame. Fans of retro cameras, who prefer their dials and levers' physicality and robustness to the minimalism of today's digital equivalents, will find much to admire here. The main back screen on the X100S is a 2.8-inch LCD that offers 100% frame coverage - so what you see is what you end up with - and boasts a 460,000-dot resolution. With a lot of LCDs in this price bracket offering a semi-pro 920K dots or more, this feels like a feature that could also have been ramped up between generations. The thick plastic screen surround that remains from its predecessor feels like a bit of a wasted opportunity; either the screen size could have been widened to the industry standard 3-inches, or the LCD could have been made angle adjustable - there appears room for both, though perhaps the latter option would have clashed with the Fuji's retro aesthetic. Also of particular interest here is the X100S' hybrid viewfinder, which allows for eye-level shooting and is 'hybrid' by virtue of the fact that we have the choice of looking through clear glass for the optical viewfinder or switching to an electronic view through the same 'window'. A dedicated button is provided for adjusting view mode', though there is also a built-in eye sensor ranged next to it for automatic operation. Very cool indeed. The Fuji X100S' supplied NP-95 lithium-ion battery, which comes with standalone mains charger, offers users up to 300 frames from a full charge. This is a respectable performance compared with the average compact and CSC, though falls short of most DSLRs that could alternatively be bought at this price, currently a street/online price of just under a grand. A bright/fast maximum f/2 aperture lens meant that, as with the earlier X100, we were able to get some very professional looking shallow depth of field results shooting with the X100S. This means it's great for portraiture where you want the eyes razor sharp, but other facial features more flatteringly soft, or if you want to focus on a particular aspect of a scene, but progressively blur the rest so it doesn't distract. As we mentioned earlier, recording video involves first selecting the relevant drive mode via the backscreen display - there's no dedicated red record button like there is on 99% of compacts these days and an increasing number of DSLRs, so whilst the feature is here, it is better hidden than it needs be and is not instant. Starting and stopping recording merely involves an initial and then subsequent press of the shutter release button. Also, as there's no zoom, if you want to adjust framing mid recording you simply have to walk forward or back. A decent lens and sensor and the ability to focus manually to draw the eye to specific details does, however, mean that it's easy to get some rather lovely looking professional results. Like its predecessor, the 16 Megapixel APS-C sensor-toting Fujifilm X100S is a bit of a curio that sits between the old world and the new digital one. It's again inspired by the operational aspects of rangefinder cameras - complete with top-plate dials and, here, Fuji's heritage-drawing film simulation effects modes - yet implementing that digital SLR-sized sensor at its heart. Again, anyone who has lusted after a Leica camera, but could never afford one is directed to the Fuji as an alternative that looks and feels anything but budget. While it's not a direct replacement for that DSLR, it may well tempt photo enthusiasts to leave it at home and take the X100S out instead anyway - particularly for candid portraits, street and travel photography - if they can justify the eye-watering price tag.